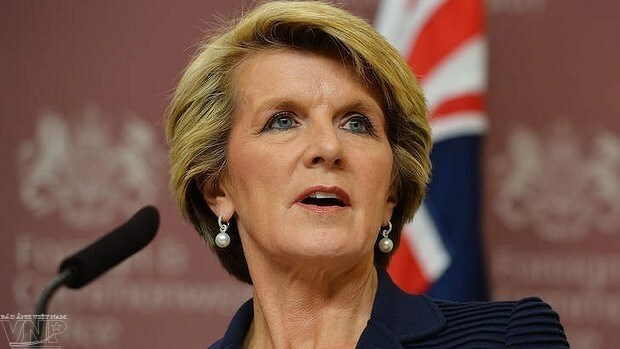 Sydney (VNA) – Australia’s Minister for Foreign Affairs Julie Bishop began her six-day visit to Thailand and the Philippines on August 2 to enhance the bilateral relations and promote Australia’s economic and security benefits in Southeast Asia. In Bangkok, Bishop is scheduled to meet with her Thai counterpart Don Pramudwinai and other Thai ministers and leaders to discuss measures to increase the role of Australia in political, economic and security issues. On this occasion, Australia will officially launch a new embassy in Bangkok, which is considered one of the biggest external events of Australia this year. She added that Australia and Thailand are celebrating the 65th anniversary of diplomatic ties in 2017. Thailand is the eighth biggest trade partner of Australia. In Manila, Bishop will attend the East Asia Summit, the ASEAN-Australia Ministerial Meeting, and the ASEAN Regional Forum along with activities to celebrate the 50th founding anniversary of the bloc. The meetings will focus discussion on major challenges in the region, including the East Sea matter, the Korean Peninsula, and terrorism. Bishop said she is co-chairing the ASEAN-Australia Special Summit in Sydney of the New South Wales State in March 2018 to affirm the significant contributions of ASEAN to promoting regional peace and prosperity.